Fixed bead rings are popular piercing rings you can use for many different piercings. They have a common round design that makes them very elegant. These rings have a bead that is fixed to the body of the ring. The bead, typically with a gem, can be positioned either vertically or horizontally. This way, fixed rings can accommodate a wide range of piercings. 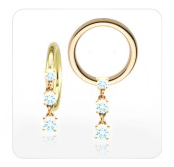 Fixed bead rings have one great advantage compared to other types of body jewelry rings. They have a bead that is permanently fixed to the body of the ring. It means that it almost impossible to lose it. This is an advantage over Captive Bead Rings that make it very easy to lose the bead, or even over Screwball rings since their bead can be unscrewed. Another advantage to fixed bead rings is that they typically come in both vertical and horizontal variations. All fixed bead rings come with a bead as a primary decoration. The shape of this bead varies so there are many different possibilities to choose from. Most of these rings have a gem inside of a setting. Popular decorations include flower-shaped gems, trillion, marque and triple melee gems.